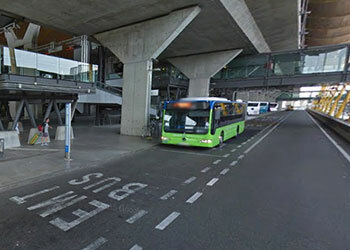 Hereinafter, you will find a list of urban and intercity bus lines arriving to Madrid Barajas airport from Madrid city centre and surroundings, as well as bus lines, leaving from the airport in direction to the city centre, fairgrounds, main transfer stations and, neighboring towns and other provincial capitals (long-distance buses). There are bus stops at all terminals (but not all the lines stop at all terminals). The airport connects Madrid city centre via urban buses of the Municipal Transport Company (EMT), lines 200, Exprés-203, N27 Exprés, and 101. Intercity bus lines 822, 824, 827 and 828 connect the airport with other towns. Service schedule for everyday of the year: 6:00h to 23:30h. Tickets and fares are available on the Consorcio de Transportes de Madrid . Line Exprés airport: Atocha/Cibeles - O'Donnell - Airport. The line 203 or Exprés Aeropuerto (Airport express) is the express line connecting the Atocha train station and the airport of Madrid-Barajas. The bus runs 24 hours 365 days a year. Atocha bus stop (beginning/end of route) works only in daytime, 6:00h to 23:30h. Overnight, bus stop beginning/end of route is in central Madrid (Cibeles), and the bus is renamed as N27 Exprés Aeropuerto. Runs: every 15-20 minuts during daytime (6:00h to 23:30h) and every 35 minuts at overnight (23:30h to 6:00h). The journey Atocha - terminal T1 takes around 30 minuts in normal traffic conditions. Terminal T1 floor 0, Arrivals area. Terminal T1 floor 1, Departures area. Route: Go - Return . Line 200: Avenida de América - Airport. Fast bus connecting Avenida de América (transport Hub) and the airport. Schedule: 5.00h to 23.30h. Bus every 10-20 minuts. Terminal T1 floor 0, Arrivals area, in front of the baggage claim area hall 2. Line 101: Canillejas - Airport - Pueblo de Barajas. The line 101 connects Canillejas transport Hub and the airport. Schedule: Monday to saturday: 6.00h to 23:25h, Sunday and public hollidays starts 7:30h. Waiting time 13 minuts until 30 minuts. Line 822: Madrid airport -Coslada-San Fernando de Henares. The line 822 starts at Madrid airport terminal T1, destination Coslada and San Fernando de Henares. Schedule: 6:00h to 23:30h., all the year. Line 824: Airport - Torrejón de Ardoz - Alcalá de Henares. The line 824 starts at Madrid airport terminal T1, destination Torrejón de Ardoz and Alcalá de Henares. The journey Atocha - terminal T2 takes around 35 minuts in normal traffic conditions. Terminal T2 floor 0, Arrivals area. Terminal T2 floor 2, Departures area. Terminal T2 floor 0, Arrivals area, in front of the baggage claim area hall 5. The line 824 starts at Madrid airport (terminal T1), destination Torrejón de Ardoz and Alcalá de Henares. Schedule: 6:40h to 22.00h., all the year. Route Return (Airport - Avenida de América), bus stop at terminal T3 floor 0, Arrivals area, in front of the baggage claim area hall 7. Route Go (Avenida de América - Airport), the bus doesn't have stop at terminal T3. Route Return (Barajas-Canillejas), bus stop at terminal T3 floor 0, Arrivals area, in front of the baggage claim area hall 5. Route Go (Canillejas-Barajas), the bus doesn't have stop at terminal T3. The journey Atocha - terminal T4 takes around 40 minuts in normal traffic conditions. Terminal T4 floor 0, Arrivals area. Line 827 Tres Cantos-Metro de Canillejas (Madrid). The line 827 connects Madrid (Canillejas), Madrid airport terminal T4, Alcobendas, the Autonomous University, and Tres Cantos locality. .
Line 828 Madrid (Canillejas)-Alcobendas-Universidad Autónoma (Autonomous University). The line 828 connects Madrid (Canillejas), Madrid airport terminal T4, Alcobendas and la Universidad Autónoma. Route: Ida - Vuelta . Empresa Municipal de Transportes (EMT) 914 068 810 || from 07h to 21 h.
Long-distance buses from/to Madrid Airport. From Madrid Barajas airport you can also take long-distance buses. The bus company Avanzabus offers direct round-trips to Madrid-Ávila, Madrid-Salamanca, Madrid-Valencia, Madrid-Zamora y Madrid-Castellón. Departures from terminal T1, bus parking. Departures from terminal T4, floor 0, Arrivals area. The bus company Alsa has the routes Madrid-Zaragoza, Madrid-Barcelona, Madrid-Valladolid, Madrid-León, Madrid-Murcia, Madrid-Alicante, Madrid-Gijón, Madrid-Oviedo, Madrid-Lugo, Madrid-Coruña, Madrid-Santiago de Compostela, Madrid-Burgos, Madrid-Vitoria, Madrid-San Sebastián, Madrid-Santander, Madrid-Bilbao, Madrid-Logroño y Madrid-Pamplona departing from Madrid airport. The bus company Socibus connects to several capital cities and areas in Andalusia: Ayamonte, Córdoba, Cádiz, Jerez, Sevilla, and others.